Part of the episode’s attraction, apart from some smart plotting and tight direction, is the excellent case. Edwin Richfield is back with a splendid accent that gets a lot stronger in the location footage. Arthur Lowe plays a car enthusiast who, while only being a pale imitation of Ronald Fraser’s Sir Horace Winslip in The Grave-Diggers has decanted his (responsibly non-alcoholic) beverages into replica fuel pumps. His racing car uses a somewhat more sophisticated form of back-projection than Winthrop’s (i.e. it’s film, rather than a man cranking a rotating screen) which isn’t as fun. The first shot doesn’t show that it’s a prop – a self-referential joke? – but possibly a poor choice in to draw attention to back-projection given some of the atrocious examples of it later in the episode (and throughout this season). The game must have been quite cutting edge for it’s time, though? A racing simulation with high-resolution graphics must have seemed like science-fiction back then! This is one of the very few scripts this season not to have been written by Brian Clemens or Philip Levene – it’s by Michael Winder. It’s a thrilling chase, but it doesn’t excel on the dialogue and resorts to some naff sexism for laughs (Benstead commenting on Mrs Peel’s marvellous chassis, Steed on Penny’s short skirt, and when Carl gets chased off by Mrs Peel he comments “she’s well and truly emancipated, that one”). The rip-off of “To Keep My Love Alive” with the many deaths of Penny’s fiancés (“the poor dear fell into a buzz saw”) quickly gets old. But once the show hits the road, we get some entertaining shenanigans (the predictable yet satisfying business with the sign being double-sabotaged, so it ends up pointing the right way). Swingingdale may look familiar if you are a regular visitor to the blog, or you’ve seen the episode Murdersville. 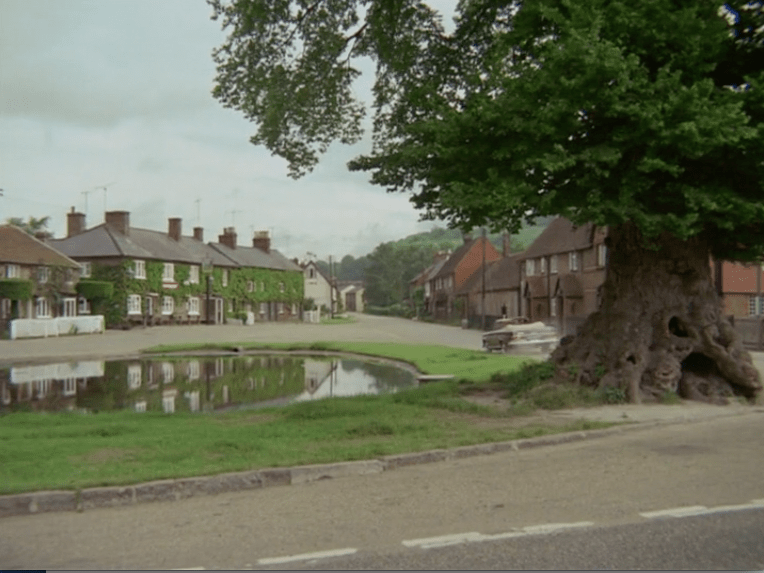 It’s Aldbury, a.k.a Little-Storping-in-the-Swuff as pictured in my header banner. And Emma’s partner bears a passing resemblance to Gareth Hunt, which is disconcerting if you’re familiar with The New Avengers. He’s even called Mike. The game with the (lethal) electric shocks is somewhat reminiscent of The Danger Makers, although this scene lacks both the style and the tension of the climax of that episode. In particular it loses all credibility when it starts going backwards. Though things get even sillier in the tag scene where – again, playing a joke on the viewer by using tricks of filming in appropriately – the sound of Steed’s shaver is swapped for that of a racing car, and worse still, it’s given a reverse mode… Still, it’s not the first time we’ve seen Emma wearing a moustache.